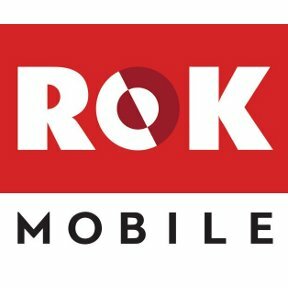 ROK Mobile is a new non-contract MVNO with a focus on streaming music that is expected to launch on July 4. ROK's main selling point is unlimited, ad-free music streaming. ROK will have a single plan that includes unlimited calling, messaging, data and streaming music for $49.99/per month. It's not clear if the no-contact service will be postpaid or prepaid or if taxes and fees are included in the price or extra. ROK will offer iPhones and high-end Android devices and will also let customers use their own compatible phones. ROK phones will run on either Sprint or T-Mobile network, depending on the phone model. ROK is the latest venture from billionaire entrepreneur John Paul DeJoria who founded and owns the company behind Paul Mitchell hair products and also co-founded Patron Tequila. Deloria's co-founder in the ROK Mobile venture is Jonathan Kendrick, a British mobile and entertainment entrepreneur. ROK will let users create their own playlists from a library of 20 millions songs from the Sony, Warner Music and Universal catalogs. It can also work like Pandora or Beats Music to deliver a customized music stream based on the user's favorite songs, artists and genres. A unique ROK feature will let customers specify their "mood", with ROK modifying the music selections to suit the user's professed mood. I'm thinking this means ROK will do things like favor calming sounds when you're angry or stressed or upbeat tunes when you're in a funk. I'm always very suspicious of any MVNO claiming to offer unlimited data. There always turns out to be a cap or a throttle. ROK co-founder Kendrick told GigaOM's Kevin Fitchard that ROK's data is truly unlimited as long as users restrict their data usage to on device consumption and don't use ROK as a home broadband replacement. That sounds like tethering and hotspot aren't going to be supported. Kendrick didn't say anything one way or another about throttling, leaving that possibility open. But provided ROK includes at least 2GB of unthrottled data per month and doesn't pad the price with post-paid style fees, $49.99/month is a very competitive price for unlimited talk, messaging, data and high-quality, ad-free music streaming. I hope to learn more about ROK when they launch next week. It looks like ROK Mobile will only be available online initially as they don't seem to be recruiting dealers and haven't announced any deals with retail chains. You can "pre-register" for the service now at rokmobile.com. I wonder if it's like muve music that is stored on your phone and you don't need any data or cell connection to replay? I wonder if they will offer autopay discount and free SIM cards or family discount ? The way these MVNO's have been popping up and disappearing lately makes me very wary, but ROK seems to have some big money behind it. That being said, ever since I took a job transfer to northeast Tennessee from NJ, Sprint and T-Mobile are no longer viable options for me. Down here, Verizon is king, with AT&T a close second. Agreed, Since I have been traveling for work over 3/4 of the country, Verizon is king by a wide margin. Another MVNO that will follow PrepaYd, Solavei, Zapp, in two to three years, maybe a little longer since this is own by a billionaire. Time will tell. The Paul Michell hair MVNO. Sounds very interesting, but disappointed that it is attached to the the networks.providers with the worst coverage, instead of those with the best coverage. I'd consider it if it were with ATT/Vz instead of Sprint/TMO. To continue on the line of thinking from Zach, Sprint is not a king, and is barely a jack. T-Mobile is the 3 of Clubs. Verizon and Sprint prepaid data speeds are so lame. You deprive yourself on Vzw all year, just so you can brag you have a signal 3 times a year out on some dirt road? How masochistic of you. At least Ting and Republic give you free roaming, but where are ail the missing Sprint LTE signals we were supposed to see by now? Way behind schedule. If you want the best of two networks, combine AT&T and T-Mobile and get their fast networks in your plans. E.G., Consumer Cellular with LTE and T-Mobile voice and data roaming. T-Mobile prepaid with LTE, and free AT&T voice roaming. Truphone T-Mobile HSPA+ with AT&T voice and data roaming, and the ability to lock your phone on AT&T when you need to. T-Mobile serves up the fastest LTE in the top 30 metro markets, where people actually live, work and usually play. AT&T is close behind, speed-wise. They both have fast HSPA+ as backup. AT&T has broad coverage across the country. Drive way out of town a lot, in areas where there is no AT&T? If you HAVE to carry a Vzw phone, toss one of their dumb phones in your glovebox (as little as $2.50/month). Stop depriving yourself of fast mobile data.